The following information is provided for convenience as part of the service we offer at this website. However, Little Aird Hill, badachrocottages.com cannot accept any liability for its accuracy or content. Visitors who rely on this information do so at their own risk. Little Aird Hill is not responsible for the contents or reliability of the linked web sites and does not necessarily endorse the views expressed within them. Listing shall not be taken as endorsement of any kind. We cannot guarantee that these links will work all of the time and we have no control over availability of the linked pages. Material featured on this site is subject to copyright protection unless otherwise indicated. The copyright protected material may be reproduced free of charge in any format or media without requiring specific permission. This is subject to the material being reproduced accurately and not being used in a derogatory manner or in a misleading context. Where the material is being published or issued to others, the source and copyright status must be acknowledged. The permission to reproduce Little Aird Hill copyright protected material does not extend to any material on this site which is identified as being the copyright of a third party. Authorisation to reproduce such material must be obtained from the copyright holders concerned. Check availability and book your self catering holiday cottage. 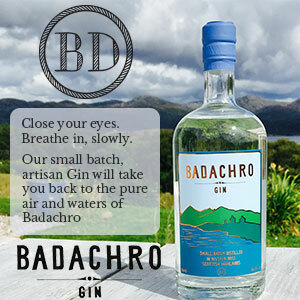 Find out more about Badachro Gin. Little Aird Hill is delighted to be part of the innovative North Coast 500. We have welcomed an increasing number of visitors to our self catering cottage over the summer and autumn. Keep up to date with news and great offers from Little Aird Hill. © 2019 Little Aird Hill. All rights reserved. Website by webPorty.